“We both thought, me and my wife, ‘that guy might get killed,’ ” said Amir Schur, 46, who helped box in the driver until police arrived. Schur’s wife, Taisha Gibson, recorded the bizarre episode on her phone. Schur reflected on the incident one day after the driver, Mark Paul Fitzgerald, 37, of Ashland, and Richard Kamrowski, a Framingham man who somehow escaped injury after riding for more than two miles on the hood of Fitzgerald’s SUV, appeared in court to face separate criminal charges. Court records show Kamrowski’s truck and Fitzgerald’s SUV made contact on the Pike in Weston before Kamrowski got out of his vehicle and retrieved a water bottle from Fitzgerald’s passenger seat. He ended up on the hood, smashing the front windshield with the bottle as Fitzgerald’s SUV reached speeds of 70 miles per hour. 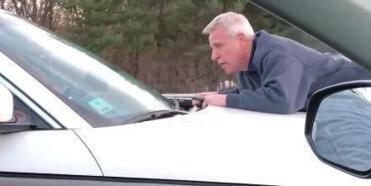 It was the incident that captured Greater Boston’s attention: One man desperately clung to the hood of another man’s speeding car — which at one point allegedly reached 70 miles per hour. Through their lawyers, each man pointed to the other as the aggressor. Fitzgerald’s driver’s license was suspended. Schur said that when Fitzgerald passed him on the Pike, Kamrowski implored him to call 911, so he did. Schur and other drivers were finally able to box Fitzgerald in, and a man named Frank Hernandez pulled a gun on Fitzgerald and ordered him out of his car, records show. “That was a big help,” Schur said. Hernandez, who along with Schur has served in the military, recounted the incident in an interview with WBZ-TV. Hernandez couldn’t be reached for further comment. Schur said he sprang into action without hesitation. Emily Sweeney of the Globe Staff contributed to this report. Travis Andersen can be reached at travis.andersen@globe.com. Follow him on Twitter @TAGlobe.